As anyone can tell you, being in high school is a really trying experience. If it wasn’t for you, that’s all fine and dandy, but for the rest of us weirdos, it’s a fundamental truth of our shared human experience. High school can be very traumatic for people. The pressure is enormous. You have to juggle friends, family, and schoolwork on a daily basis. You aren’t even sure who you really are, and yet you have a lifetime of choices to start making. Many great films have been made about it and, I am sure, will continue to be made even when I am gone. 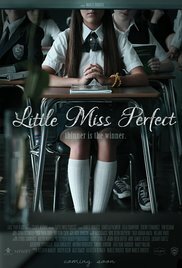 Little Miss Perfect is the latest film to cover this subject matter and does so in a way that is both interesting and human. Little Miss Perfect is the story of Belle, played by newcomer Karlee Roberts. Belle is an overambitious, straight-A freshman who has recently become president of her high school class. She seems to have it all together, but the reality of her world is more complicated than what she puts out into the world. As family trouble and academic pressures grow, Belle tries to control her chaotic world by drastically embracing a dangerous life choice that is being pushed by a pro-eating disorder blog. Directed by first-time director Marlee Roberts, Little Miss Perfect is a fascinating and moving character study that delivers an important message with grace and subtlety. It does not feel like an after-school movie of the week. It uses the topic of eating disorders to address broader themes of alienation, disconnection from your family, and the struggle of reaching for academic perfection, and what these can do to a person. Done wrong, the film could become horribly preachy and talk down to the audience. Thankfully, Roberts directs with humanity and makes these subject matters feel natural and unobtrusive. The core strength of the film comes in its compassionate treatment of its main character, Belle. Unlike most movie teenagers, she feels like a real person. She is not a walking, talking quip machine. She is a real human being with real human vulnerabilities. Roberts does a fine job of making the character fully rounded. There is no moment in the film where I felt that Roberts was judging the character, which I think, is important in a film about teenagers. If you are making a film about young teenagers, I think you need to have empathy for the characters, and Roberts does a great job of making us care. As a film, Little Miss Perfect is one of the finer movies I have seen this year. It is a humane and moving look at something that is all too real for young people. I am so glad that I had the chance to see this film and I hope that you consider seeing this film as I think it is both timely and important.